Heraldry (Back) in the News! No, really, I don't think I understand the reasoning. If a logo is not the least bit heraldic, then why place it on a shield shape? What can the motivation for that be? It's not like the standard heater shield shape is at all intuitive, not like a square, or a rectangle, circle, or oval is. And yet, I regularly see non-heraldic logos placed on shields. The example that got me to thinking about this anomaly was on a business card that I picked up several years ago while attending a conference on heraldry in North Carolina. As an adjunct to that conference, those attendees who wished had the opportunity to visit the rare books collection at the University of North Carolina at Greensboro. Since I'm never one to pass up the opportunity to peruse old books, I went along. But while there, my eye was caught by the UNC Greensboro logo on the business cards there. See what I mean? I find myself regularly drawn to shield shapes, since I'm always on the lookout for heraldry and its use in the United States today and in the past. But this isn't heraldry, is it? Yes, it's on a shield shape, but that is its only relationship to a coat of arms. The colors of the logo are the school colors: gold, white, and navy blue. The date, 1891, refers to the school's establishment (at that time, as the State Normal and Industrial School. It's had several name changes since then). The primary figure I first took to be Athena, the Greek goddess of wisdom, but it may simply be a representation of "Spiro, the Spartan," the student body there being the Spartans. (As was the student body at my old college, Michigan State University. But our colors were green and white.) 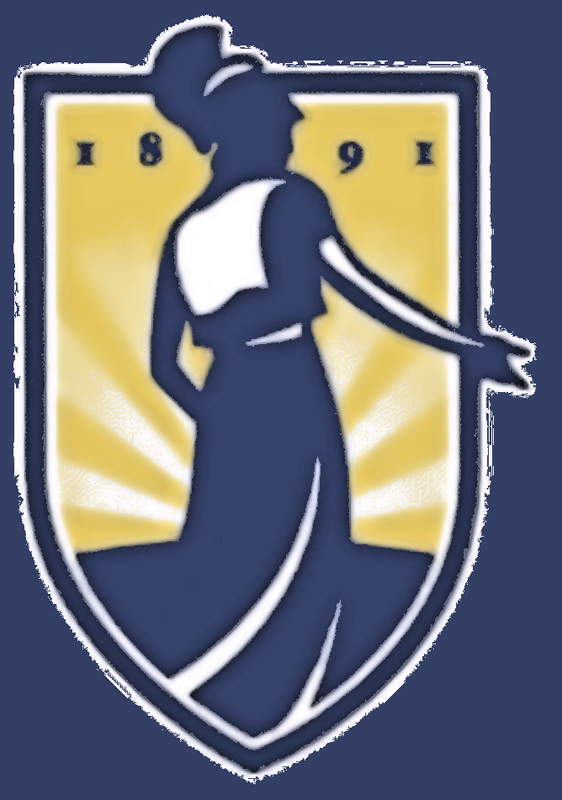 The figure being female, it may also refer back to the university's founding as a women's college. But for all of that, it's not heraldry. So why is it on a shield? (And its not even an old Greek shield, or a roundel, which would at least keep the theme of "Spartans" going. But a heater shield? Not so much.) To steal a line from the movie Shakespeare In Love, "It's a mystery." I wonder if heraldry and heraldic art is taught as part of graphic design degree programs? Perhaps you could teach such a course? I expect there are a few graphic design degree programs that may touch upon heraldry, but not many, and probably not in depth. And as someone who isn't really an artist myself, I don't think that I'm sufficiently qualified to teach such a course. I could, of course, be wrong about that last; I feel I certainly have the theoretical knowledge that I could pass on to students. How about it, colleges and universities? Anyone want to pay me to teach heraldry? I have a degree in graphic design, but I was never taught anything heraldry related. One of my instructors said shield shapes are timeless and works well in logo design. Thank you for that information. I don't suppose that your instructor gave you any particular reason(s) why shield shapes are timeless or why they work well in logo design? Knowing the history of heraldry, I can understand why they may be seen as timeless, but I'd love to know more from the graphic design viewpoint. I'm a bit late in commenting, but I just saw your blog post. I'm a UNCG student, and she's Minerva. I'm not sure if that helps in why they chose that shield type or not.